Acta Cryst. (1996). A52, 329-330. Yuri Timofeevich Struchkov, Vice-President of the IUCr, passed away on 16 August 1995, at the age of 69, in the hospital of the Medical University of South Carolina at Charleston, USA. His ashes were interred in the Donskoy Cemetery of Moscow. He was one of the pioneers of X-ray crystallography applied to chemistry in the former USSR. Since the report on the structure of iodoform in 1953, Yuri and his team (built up in the Institute of Organoelement Compounds of the Academy of Sciences of the USSR) have contributed more than 1000 entries to the Cambridge Structural Database (CSD). By means of this enormous output of work, he gradually convinced organic chemists in the whole of the USSR of the power of X-ray diffraction in synthetic organic chemistry. Under his guidance, more than 60 PhD students completed their theses. He was always very proud to show the great number of small flags on a huge map of the USSR, hanging on the wall of his study, indicating the places where his former pupils were working. Even beyond the borders of the former USSR, there are many places where his students work. However, it is not so easy to remove the invisible veil from the life of Yuri Struchkov, the man and the scientist. Apart from the last few years, he spent his whole life in a very closed society determined by the rules of the Ice Age, moved by a very slow and painstaking thaw to a welcome end in 1991. Yuri was born on 28 July 1926 in Moscow at the time when the promising New Economic Policy was halted and the first Five Year Plan of Stalin pushed millions of peasants into misery and destruction. He was only 12 when his father Timofey Frolovich was arrested in 1938 as the people's enemy and executed immediately thereafter (he was, of course, innocent). Yuri and his mother lived almost in poverty in the 1930s followed by the hard years of the Great Patriotic War. The road accident in which he lost his right hand prevented him from undertaking military service. Thus, he was able to enter Moscow State University in 1943. In 1948, he graduated in chemistry and became a research associate of the Institute of Organic Chemistry under the supervision of the founder of organic crystal chemistry, Alexander I. Kitaigorodskii. There, he prepared his PhD thesis and defended it in the Institute of Crystallography in 1954. In the same year, master and pupil moved together to the newly opened Institute of Organoelement Compounds in Moscow. Both remained there and made invaluable contributions to chemical crystallography until their deaths. Yuri always respected Kitaigorodskii as his teacher and tried to give firm support to the speculative crystal structures set up by the use of his structure finder. As a truly great personality, Kitaigorodskii never tried to subdue his subordinates. Thus, the loyal but tough Yuri soon became the head of a group working on diffraction methods within Kitaigorodskii's department and created an X-ray laboratory in which in the early 1960s about ten Weissenberg goniometers and numerous excellent Russian retigraphs were collecting data day and night. To substantiate close-packing predictions with experimental data, both Yuri and Kitaigorodskii were absorbed at that time in the structure determinations of various naphthalene derivatives. Of course, the limited computing facilities then available did not permit easy progress. Nevertheless, together with the naphthalene derivatives, a few dozen other crystal structures were also published, mainly in Russian (mostly in Zh. Strukt. Khim.). In 1977, when he won his DSc degree, Yuri already had about 170 entries in the CSD files and his achievement in the structure determinations of various organic compounds was equally appreciated both inside and outside the USSR. In the early 1980s, his X-ray Structure Laboratory already had two single-crystal diffractometers, one equipped with low-temperature facilities. Thus, his team (he had about 16 co-workers) could substantially improve the quality of their structure determinations. The new and the carefully reinvestigated early structure determinations made his annual contribution to the CSD close to 100. The total number of his publications (including papers published in journals not covered by the CSD in the early years ) amounts to ca 2000 original reports and more than 30 reviews. The core of his research activity, to mention only a few fields, involved the systematic structure analysis of transition-metal (pi) complexes, multinuclear clusters, and organometallic and bioorganic compounds. In recent years, to shed light on the peculiarities of chemical bonds, he made precise determinations of electron-density distributions. Highly unstable and liquid compounds were also investigated at low temperature, while his multi-temperature studies aimed to understand molecular dynamics in crystals. These outstanding works won him the E. S. Fedorov Prize of the Russian Academy of Sciences in 1992. One may ask why Yuri forced publication so hard, what was the motivation that did not permit him to make his mission easier? His most convincing argument for not joining the Communist Party was his deep preoccupation with research which left no time for anything else. He felt his only choice was to work hard, harder today than yesterday and much harder tomorrow. 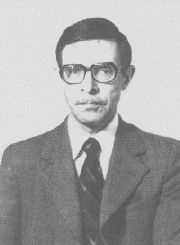 He was awarded the A. N. Nesmeyanov Gold Medal only in 1988 and elected belatedly as a Corresponding Member of the Academy of Sciences in 1990. As a worldwide appreciation of Yuri's achievement, the floor of the 15th General Assembly of the IUCr in Bordeaux (1990) elected him to the Executive Committee. In 1992, he became a member of the Russian National Committee. In Beijing in 1993, to the great pleasure of his friends, he was elected Vice-President of the IUCr. Personally, the last 15 years were enriched by our deepening friendship. I first visited Yuri's laboratory in 1981. Then we were both deeply interested in the characterization of the hypervalent bonds observed in silatranes and sulfuranes and a fruitful brainstorming debate arose between us. However, the almost compulsory gap (i.e. who is who?) between new friends in our totalitarian empire remained untouched. This wall disappeared only four years later in Torino when - after ECM-9 - I accidentally encountered Yuri in front of the cathedral which he was just leaving. Then he voluntarily admitted his deep religious commitment (still unfavoured in the USSR) and we entered into a long intimate conversation. From this it became evident that comrade Struchkov and comrade Kálmán were not comrades at all! One year later, we flew together from Moscow to Beijing to attend the first IUCr-sponsored meeting in China. Upon arrival, we were temporarily accommodated in the same room in the guest house of the Sleeping Buddha recreation centre (formerly a monastery). This intimacy and the excursions around Beijing brought us even closer. A week after the CSM-86 meeting, we met in Moscow again. He invited me to his home for dinner where he told me about his exciting experiences gained among his former students. In the early days, we had both been interested in the possible forms of the economical and political developments in the Communist world. These analyses were continued in Hungary in 1989 when he spent a few days as an invited speaker to our national crystallographic meeting. By that time, Yuri freely radiated his inner warmth and deep humanism. This iron-hard man could astonishingly be tender and friendly. But he never complained about the injuries suffered in the Soviet system. From 1990 until 1993, we served on the Executive Committee together. He was very observant of every issue on the agenda and I frequently admired him for his quick, detailed notes made in English. In my memory there are many lovely pictures of Yuri, but the most vivid is at breakfast on the first morning after our arrival (22 August 1991) in the sunny garden of the Riverside Hotel in Chester. Sitting quietly, we felt an eternal peace: he could travel to the UK without trouble and delay since the coup of Yanayev in Moscow had quickly collapsed and something new had started in his beloved mother Russia and in the whole of Eastern Europe. I thank Anton Struchkov and Alex Yanovsky for personal information.